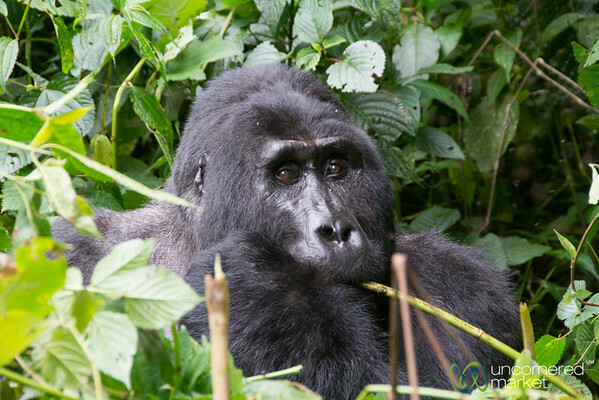 Read more about and how to visit mountain gorillas. 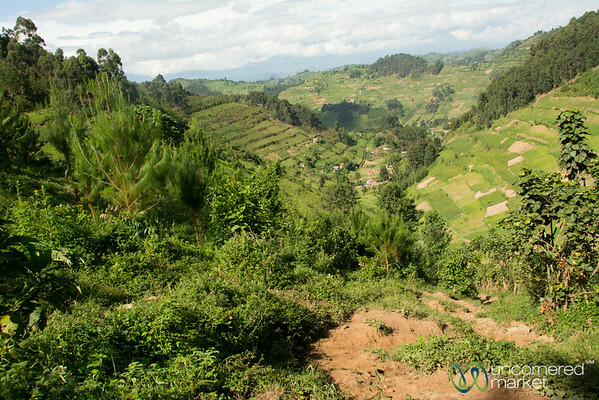 Our gorilla trek begins with taking us through villages and fields to get to Bwindi National Park, Uganda. 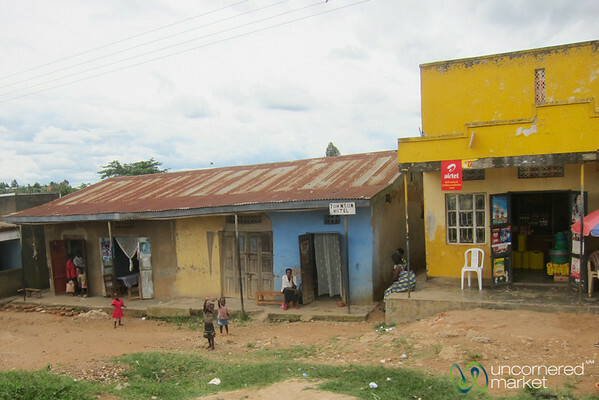 The style of architecture and colorfully painted buildings that you see often along the roaads of Uganda. 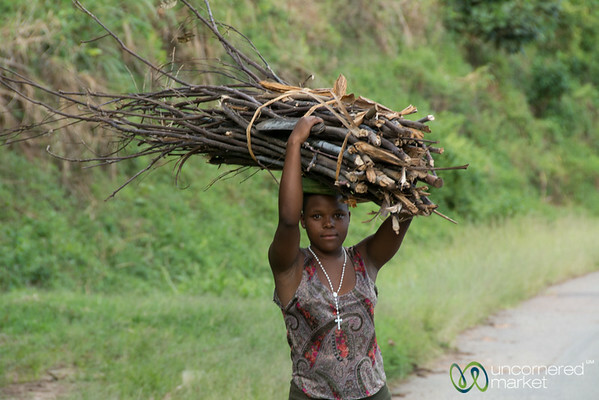 A Ugandan woman carries back firewood to use in cooking. Near Kalinzu Forest Reserve, Uganda. 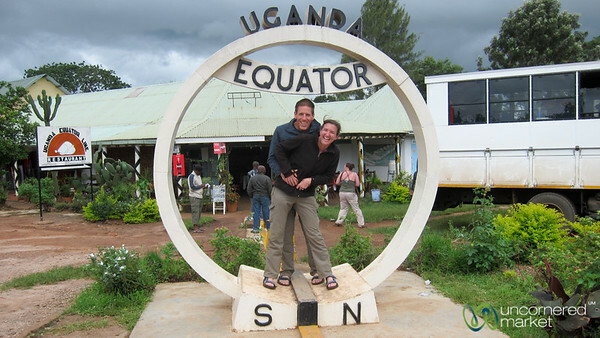 Dan and Audrey standing at the equator line in Uganda. 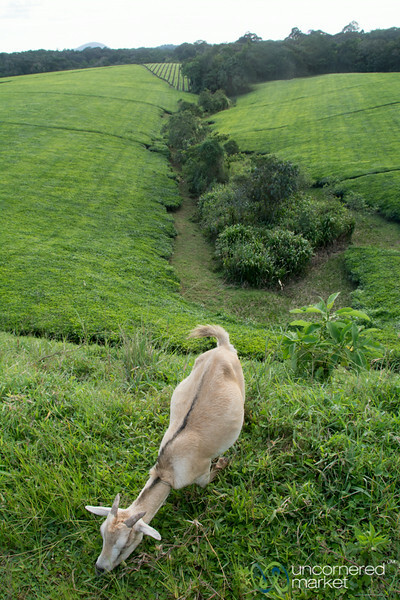 A goat snacks on the edge of the tea plantation near Kalinzu Forest Reserve in western Uganda. 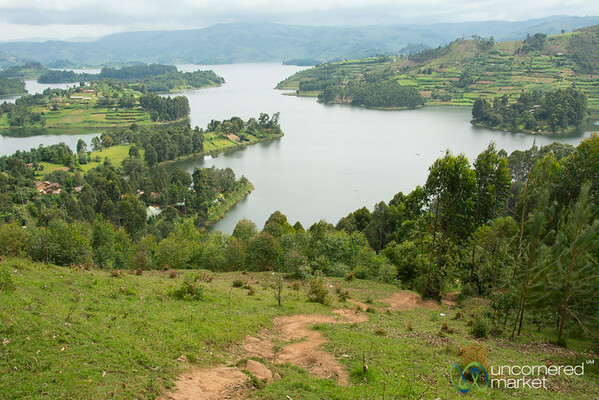 See if you can spot the tents on the left side to find our campsite at Lake Bunyonyi, Uganda. 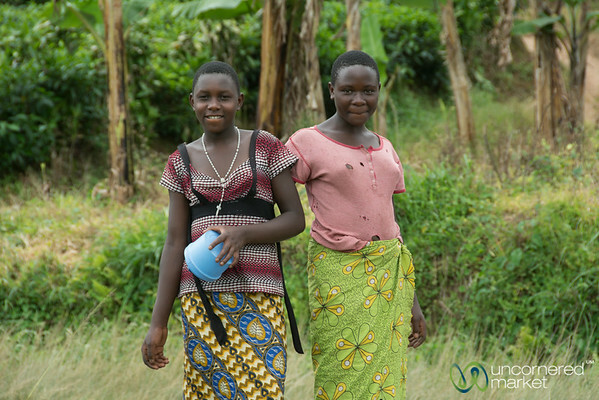 We meet a couple of friendy women on the road near Kalinzu Forest Reserve in western Uganda. Young kid with a hoe. Getting an early start with farming. 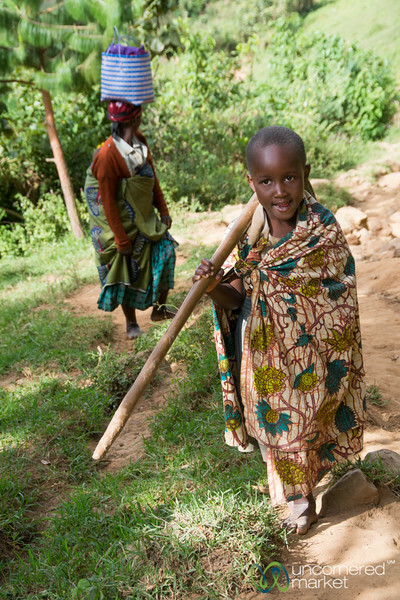 Bwindi, Uganda. 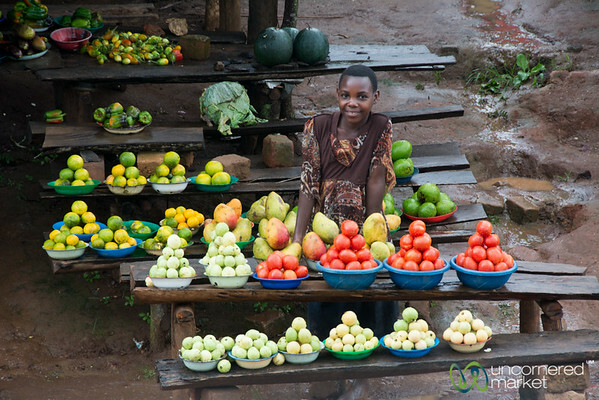 A roadside fruit stand with friendly vendor outside of Kampala, Uganda. 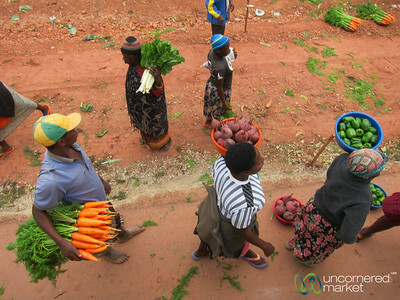 Baskets and piles of fresh veggies sold on the road in Uganda. 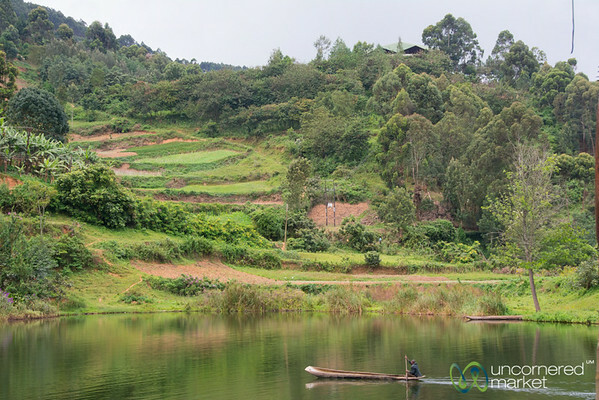 A dugout canoe goes speeding by on Lake Bunyonyi in Uganda. 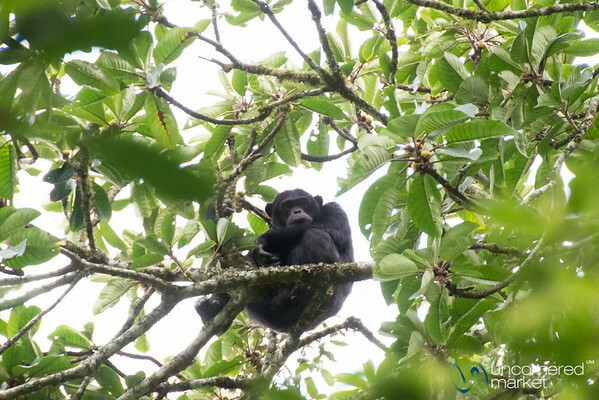 A chimpanzee hangs out high in the trees above us at Kalinzu Forest Reserve in western Uganda. 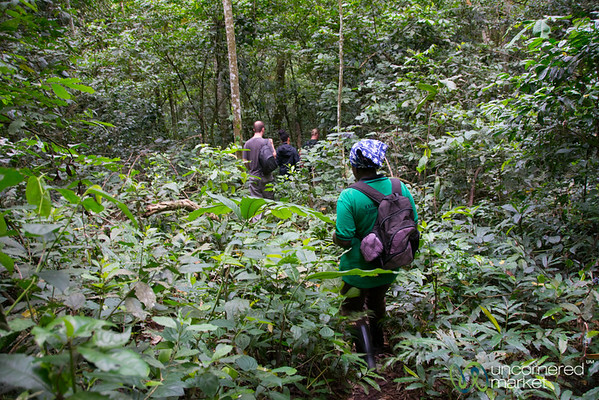 Going deeper into the forest for chimpanzee trekking at Kalinzu Forest Reserve in western Uganda. 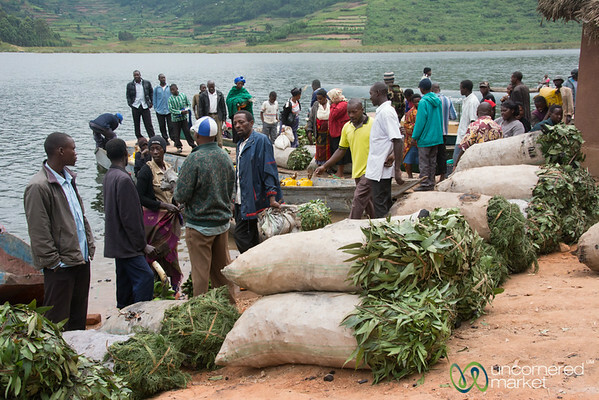 Boats bring in sacks of charcoal to a weekly market on Lake Bunyonyi, Uganda. 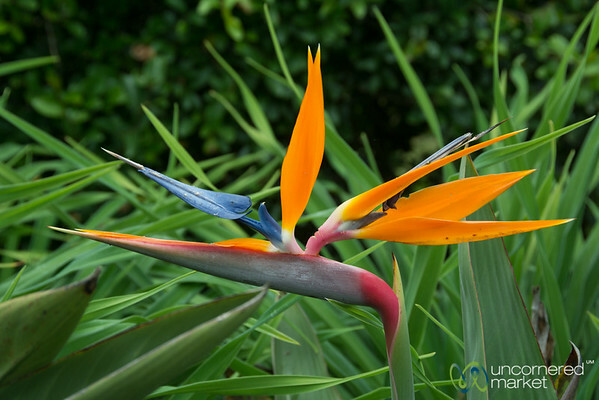 A bird of paradise flower near Lake Bunyonyi in Uganda. 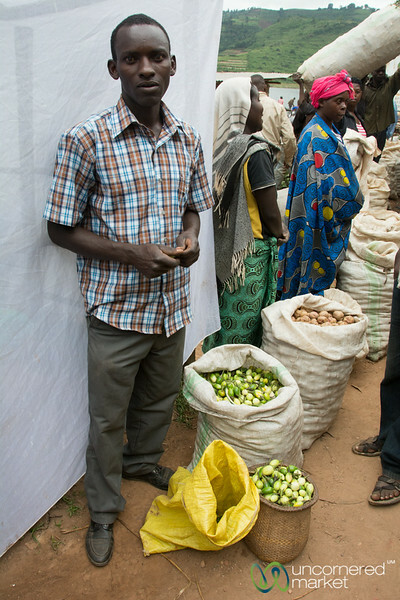 Selling green eggplant / bitter tomatoes at the weekly market at Lake Bunyonyi, Uganda. 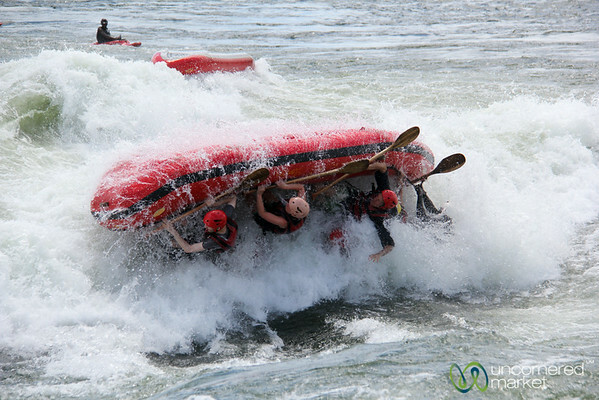 Our boat does a flip going over the rapids of Nile River near Jinja, Uganda. Spending time with Kakono, the large silverback male gorilla in the Mishaya group at Bwindi National Park, Uganda. 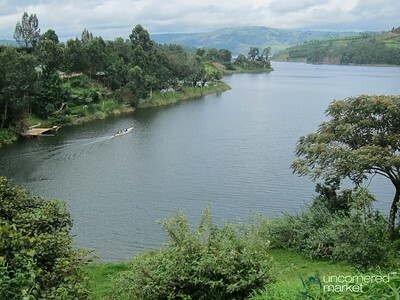 Trekking up to Arcadia Cottages above Lake Bunyonyi, Uganda. 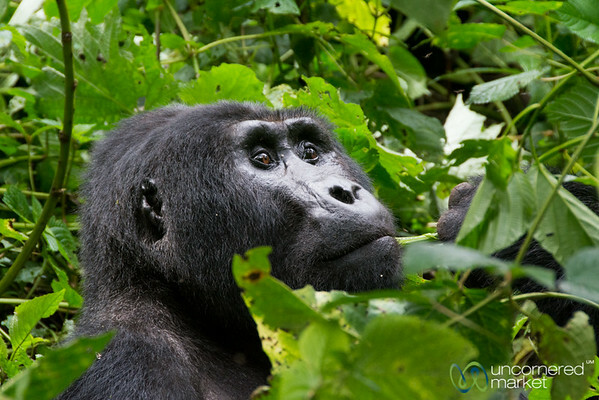 Kakono, the pensive gorilla eats and eats during our visit with him at Bwindi National Park in Uganda.